The construction of formwork takes time and involves expenditure upto 20 to 25% of the cost of the structure or even more. Design of these temporary structures are made to economic expenditure. The operation of removing the formwork is known as stripping. Stripped formwork can be reused. Reusable forms are known as panel forms and non-usable are called stationary forms. Timber is the most common material used for formwork. The disadvantage with timber formwork is that it will warp, swell and shrink. Application of water impermeable cost to the surface of wood mitigates these defects. Hence PERI uses formwork girders like VT20K and GT24 in place of timber which are very nailable and have very high life. It should be strong enough to withstand all types of dead and live loads. It should be rigidly constructed and efficiently propped and braced both horizontally and vertically, so as to retain its shape. The joints in the formwork should be tight against leakage of cement grout. Construction of formwork should permit removal of various parts in desired sequences without damage to the concrete. The material of the formwork should be cheap, easily available and should be suitable for reuse. The formwork should be set accurately to the desired line and levels should have plane surface. It should be as light as possible. The material of the formwork should not warp or get distorted when exposed to the elements. It should rest on firm base. Minimum sawing and cutting of wooden pieces should be made to enable reuse of the material a number of times. The quantity of surface finish depends on the quality of the formwork. 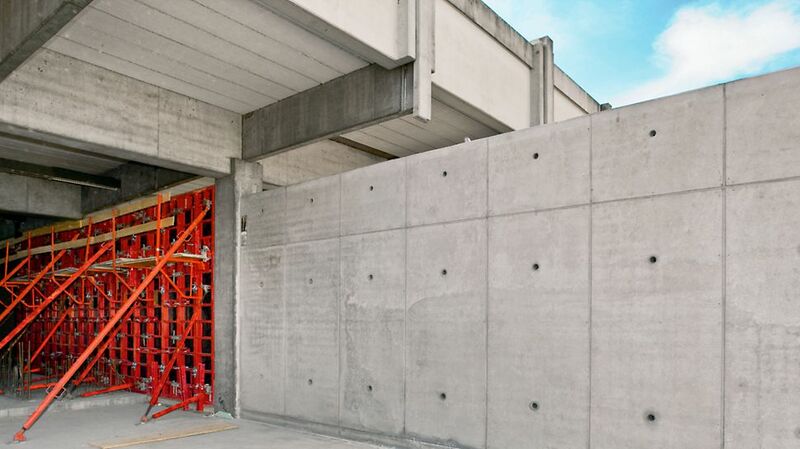 Formwork can be made out of timber, plywood, steel, precast concrete or fibre glass used separately or in combination. Steel forms are used in situation where large numbers of re-use of the same forms are necessary. For small works, timber formwork proves useful. Fibre glass made of pre-cast concrete and aluminium are used in cast-in-situ construction such as slabs or members involving curved surfaces. When the material for formwork has been chosen, and the anticipated loading estimated, a form should be designed strong enough to carry the anticipated loads safely, and stiff enough to hold its shape under full load. At the same time the builder or contractor wants to keep costs down by not overbuilding the form. Loads imposed by fresh concrete against wall or column forms differ from the gravity load on a horizontal slab form. The freshly placed concrete behaves temporarily like a fluid, producing a hydrostatic pressure that acts laterally on the vertical forms. This lateral pressure is comparable to full liquid head when concrete is placed full height within the period required for its initial set. With slower rate of placing, concrete at the bottom of the form begins to harden and lateral pressure is reduced to less than full fluid pressure by the time concreting is completed in the upper parts of the form. The effective lateral pressure −a modified hydrostatic pressure− has been found to be influenced by the weight, rate of placement, temperature of concrete mix, use of retardant admixtures, and vibration. 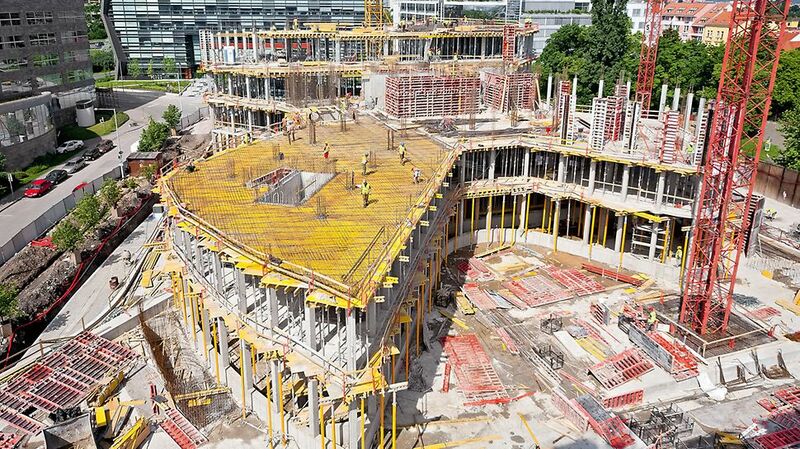 Gravity loads are from all live and dead loads applied to and supported by the formwork. These include the weight of the concrete and reinforcing steel, the weight of the forms, and any construction loads from workers, equipment, or stored materials. Loads from upper floors may also be transferred to lowerlevel forms in multistory construction. The largest loads are generally due to the weight of the concrete being formed and to the construction live load from workers and equipment. it is common to use a value for design of 25KN per cubic meter , which includes an allowance for the reinforcing steel. ACI Committee 347 recommends using a minimum construction live load of 2 KN/sqm of horizontal projection when no motorized buggies are used for placing concrete. When motorized buggies are used, a minimum construction live load of 6 KN/sqm should be used. The dead load of the concrete and forms should be added to the value of the live load. The girder wall formwork consists of timber and/or steel girders connected to each other that form the support surface for the formlining. 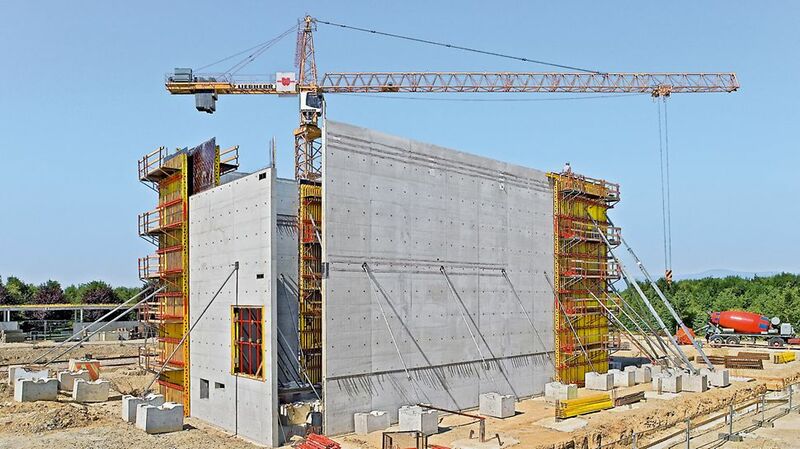 The optimization of individual elements and the development of a wide range of accessories for connections and attachments still makes girder wall formwork cost-effective in spite of the relatively high number of components. A major advantage is the flexibility in order to be able to adapt to complex shapes and high loads. In particular, architectural concrete structures with special requirements for surfaces and anchor patterns can often only be efficiently realized with girder wall formwork. The versatile PERI VARIO girder wall formwork system, customized and assembled specially for the project: Form-lining shall be 18mm densified film faced plywood. Specially designed large elements, makes shutter handling efficient in the Climbing System. PERI has introduced many panel based pre-engineered wall formworks satisfying client needs precisely such as LIWA, DOMINO, MAXIMO and LICO. Below image displays the girder based Multiflex slab system. additionally PERI provides Panel based systems like Skydeck, Grideflex etc. With the PERI UNO formwork system, walls, columns, slabs, beams and stairways are realized using the monolithic construction method. The system offers a suitable and fast solution for forming frequently repetitive floor plans - horizontally or vertically. The UNO system is characterized through easy and safe handling whereby the low weight is an important factor. The individual panels can be easily moved and transported by hand. Through the use of special wedge couplers, the wall and slab panels are assembled in a very short time. The individual panels are produced according to project specifications as well as taking into consideration the high PERI quality standards. As a result, all structural dimensions and building shapes are possible. 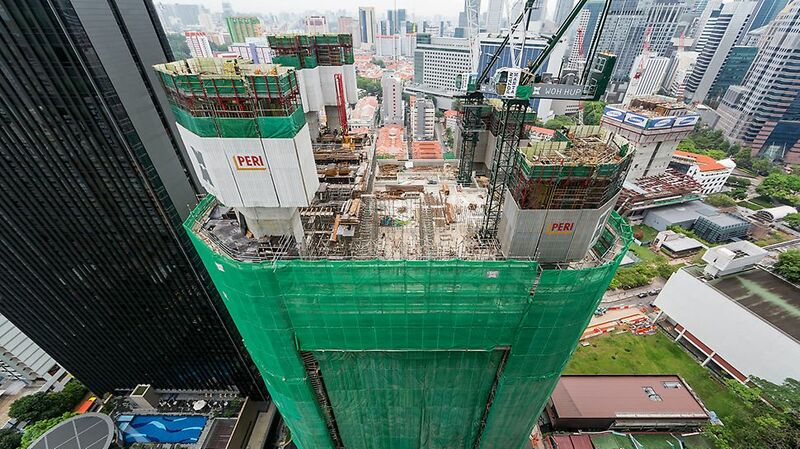 With PERI UNO, the usual number of re-use for monolithic formwork systems is achieved. 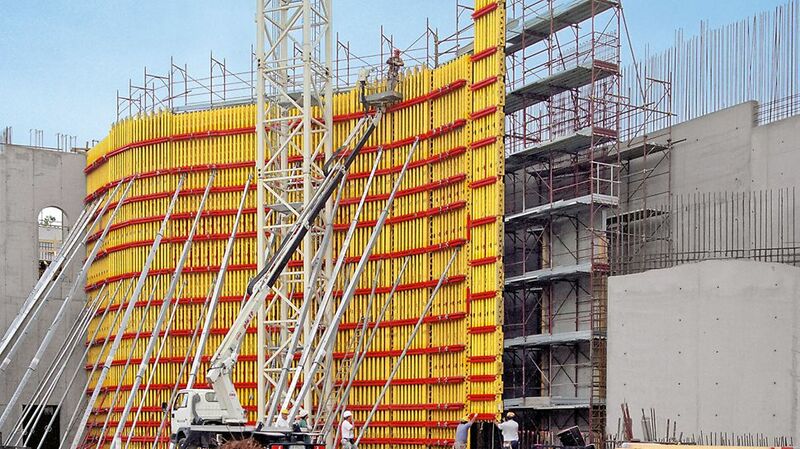 Climbing formwork is a special type formwork for vertical concrete structures that rises with the building process. While relatively complicated and costly, it can be an effective solution for buildings that are either very repetitive in form (such as towers or skyscrapers) or that require a seamless wall structure . Various types of climbing formwork exist, which are either relocated from time to time, or can even move on their own (usually on hydraulic jacks, required for self-climbing and gliding formworks). Crane-climbing: the formwork around the structure is displaced upwards with the help of one or more cranes once the hardening of the concrete has proceeded far enough. This may entail lifting the whole section, or be achieved segmentally. Self-climbing: In this type the structure elevates itself with the help of mechanic leverage equipment (usually hydraulic). To do this, it is usually fixed to sacrificial cones or rails emplaced in the previously cast concrete. PERI ACS and RCS variants for facades, building cores, shaft structures and inclined bridge pylons make the construction of high concrete structures extremely economical, fast and safe. The efficient sequence of operations from floor to floor facilitate allow a very high level of productivity and exceptionally short cycle times.